directions. Such a flow arrangement is selected to be considered in this calculation. The set of known input data is provided in the problem formulation. Subsequently, calculations are executed using an explicit step-by-step routine. The procedure follows a somewhat modified thermal design (sizing) procedure derived from the routine advocated in Shah and Sekulic (2003). The modification is related to the fact that iterative steps are listed and executed for both intermediate and overall refinements of all assumed and/or estimated entities. 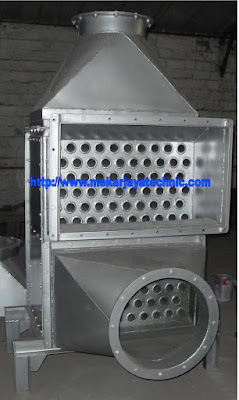 The overall pressure drop constraints are ultimately satisfied without further optimization of the design. The main purpose of the calculation sequence is to illustrate the procedure, usually hidden behind a user-friendly, but content-non-revealing, platform of any existing commercial software package. Such a black-box approach executed by a computer, although very convenient for handling by a not necessarily sophisticated user, is utterly nontransparent for a deeper insight. Consequently, this example calculation is not intended to discuss a particular design; rather, it illustratesthe procedure. Therefore, the numerical values calculated do not have importance for any particular design.